Like so much of what is understood about Cuba from those outside the country, the name 'The Bay of Pigs' is a mistranslation. 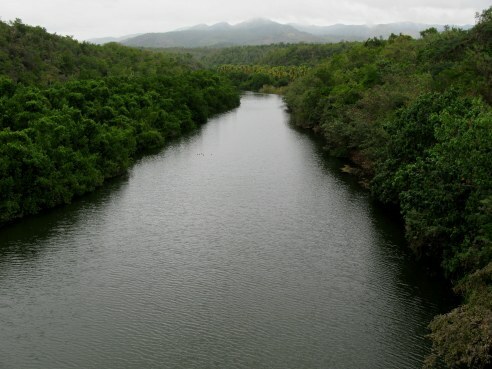 The correct name is Bahía de Cochinos – 'Cochinos' in this instance not meaning the equivalent of the derisory slang of 'dirty pig' (as against the more polite name for a pig – 'cerdo') but rather the local name for Triggerfish. The brightly coloured Triggerfish get their name from their ability to erect a bristly spine when under attack. Either way, the name 'Bay of Pigs' makes a good metaphor for some for the place where US backed Cuban exiles tried the unsuccessful invasion that marked a key turning point in the Cuban fight for independence. 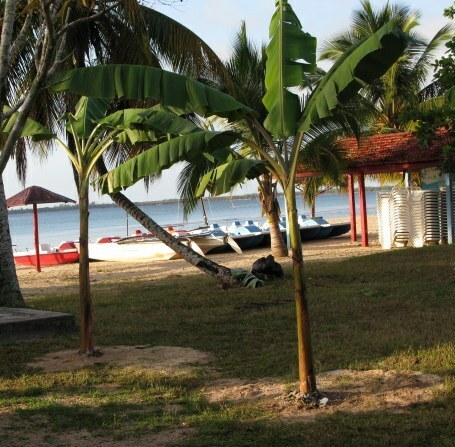 Now, it is a peaceful coastline off the spectacular coral reef of Jardines de la Reina (Gardens of the Queen) - the largest marine park in the Caribbean. 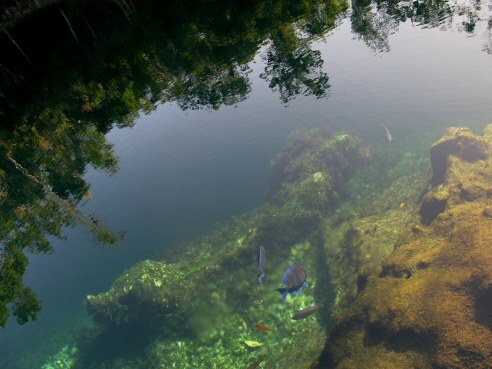 The geological history marked in its shores and the steep underground walls of the Bay of Pigs make it a diver’s delight. 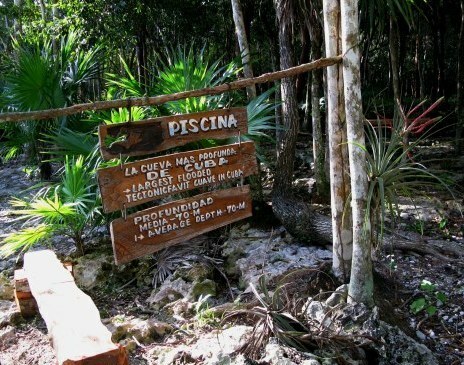 Fidel Castro was himself a diver, and since he proclaimed the park in 1966 there has been a proliferation of different fish varieties – a tribute to its protection.By 2014 Casto hadn't been diving for some years. However his friendship with Jacques Cousteau had informed his thinking about marine ecosystems, so when Robert F. Kennedy Jr., son of the late Senator Robert F. Kennedy and President of the Waterkeeper Alliance was diving in that year to map previously uncharted features of this coast, Castro wrote to him to enquire about the health of the underwater ecosystem. Kenendy was pleased to report that it was as stunningly diverse and healthy as in the past. This would be partly, if not wholly because of the effects of the July 1997, Law 81 - the Law of the Environment that was enacted in Cuba. This was designed to reverse environmental damage from the past. One of its great benefits is that bottom trawling was banned. The law's goal was to protect 25% of its coastal waters - one of the largest percentages in the world. (The world average is between 2%-3%). Unfortunately this protection has seen the arrival of colourful but voracious lion fish, natives of the Pacific Ocean. Records indicate that such an invasion of lion fish has the effect of reducing other fish varieties in a coral reef system by up to 80% if left unchecked. Florida has had the same problem – solved by encouraging local amateur fishing of the tasty lion fish – but since this level of fishing requires locals to have boats – and Cuban boats being restricted to some few authorised tourist vessels, this poses a current and growing threat to a beautiful ecosystem and tourist attraction. 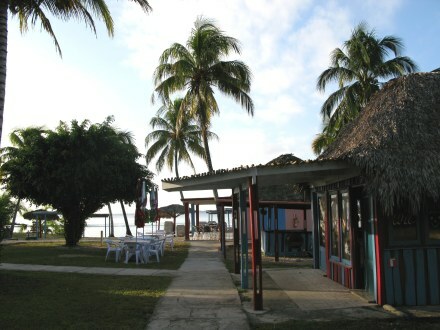 The bay itself has a variety of lodging, amongst which is the mid-range Playa Largo. 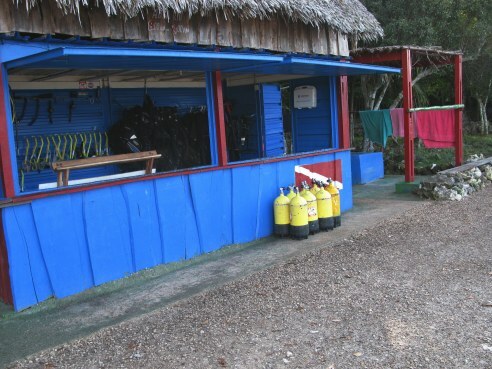 Although Albacora is a better known diving centre, Playa Largo is a good starting point for scuba diving the Jardines de la Reina, one of the world’s longest barrier reefs. 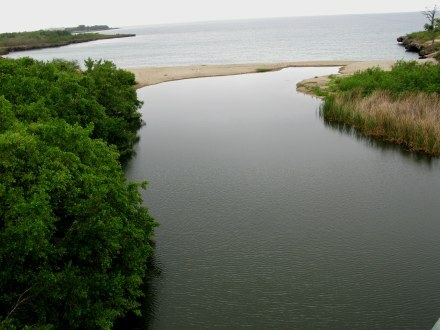 It stretches 225km (140 miles) along the southern coastline. 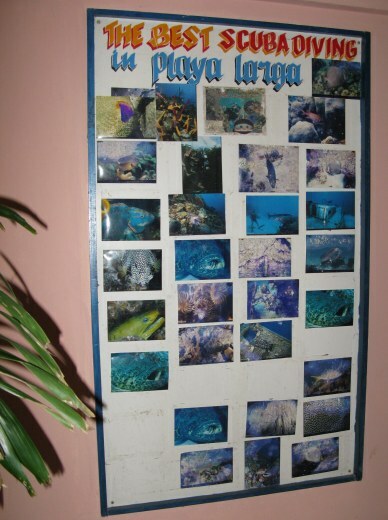 Signs in the tired hotel where I stayed showed the diversity of the marine life. The coast is a magnificent location for scuba diving - or for just taking out a yacht or pedal-boat onto the bay. 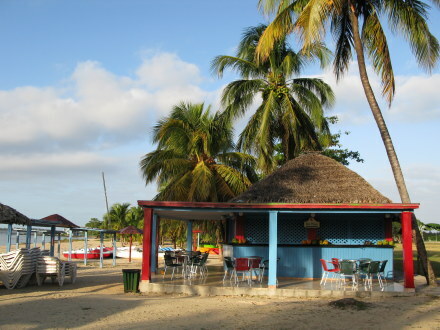 Playa Largo is colourful and friendly. 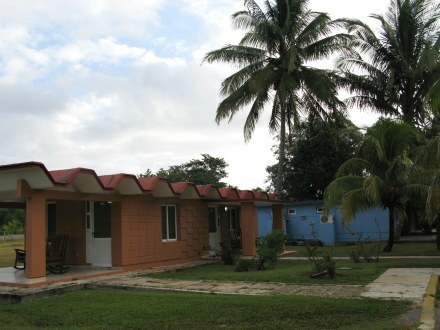 The simple but comfortable accommodation units have their own small patio. 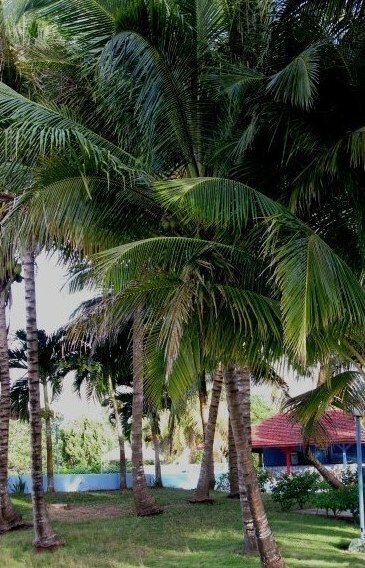 These are set in palm-canopied gardens. 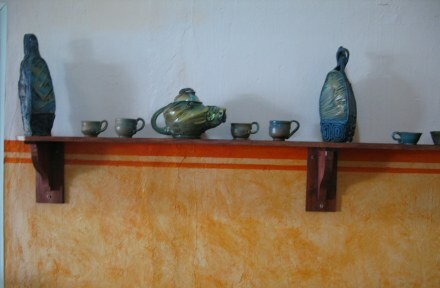 The food is excellent in the restaurant, which features local pottery - even a teapot in the shape of a fish – or is it a crocodile? 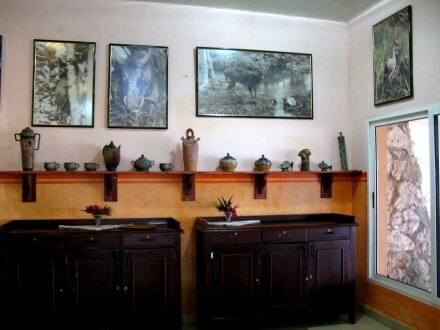 These are displayed beneath old photos of wildlife of the surrounding Parque Nacional de Cienaga de Zapata. 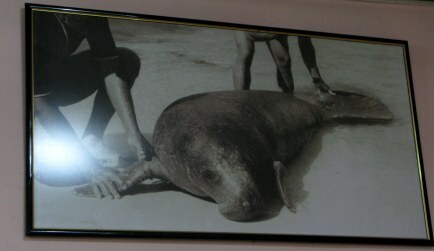 One photo is of a manatee – the gentle 'sea cow' that is becoming rarer in most areas of the world, and certainly in Cuba. A relative of the elephant and the aardvark, the manatee is classified as an ungulate despite its aquatic habitat. It grazes the sea grasses using its lips in a similar way to how an elephant uses its trunk. I had heard there were still manatee to be found in the Bay of Pigs. 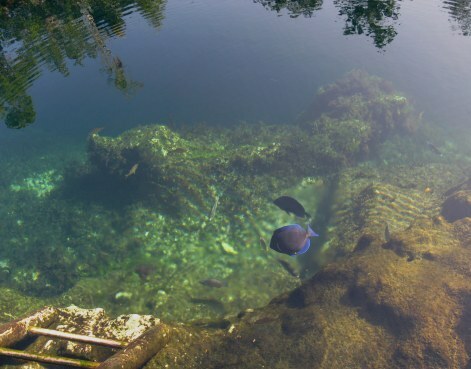 However, since their normal cruising speed is between 3kph (2mph) and 9kph(6mph)and although they surface to breathe, they can stay underwater for up to 20-30 minutes – so the chances of meeting a manatee might depend on local knowledge of their habitat. It is the manatee who was often responsible for reports of mermaids or sea sirens, perhaps their chirps and whistles luring sailors to frame everything they saw in terms of the women absent from their lives. I enjoyed the impromptu band performance with the staff of Playa Largo late one night – and was glad to be invited to dance as well. It is these moments, that leave a special memory – and so it was for me at Playa Largo. As you travel along the Bay of Pigs, the road hugs the coast. It passes by tiny hamlets and fishing villages. Some houses hug the strips between road and coastline. 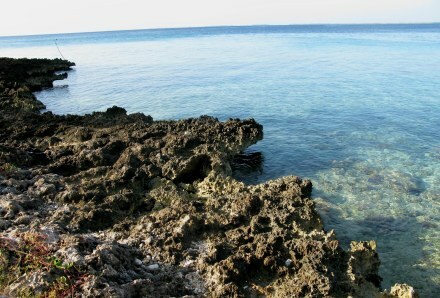 There are many inlets with isolated sandy beaches. After their long journey from the mountains, hese rivers all empty into the Straits of Florida. Not all diving is in the sea along the Bay of Pigs. There is some spectacular cave diving for the undaunted. Cave divers are special people. What drives someone to dive into an unknown world? If you are a mountaineer and get stuck, someone can fly in and rescue you – but if you are in an underwater cave through which the entrance may have been a 'press' where you had to push your tanks ahead of you – THIS is exploration with no safety net! It is cave divers who are often called to aid rescue efforts like that of the cruise ship the Costa Concordia – for the sunken vessel is the equivalent of an underwater cave – but one that sometimes shifts while being explored. Here at the La Cueva de los Peces (Cave of the Fish) the depth of the sinkhole is known only as far as 70 metres (221 feet). It may be deeper. 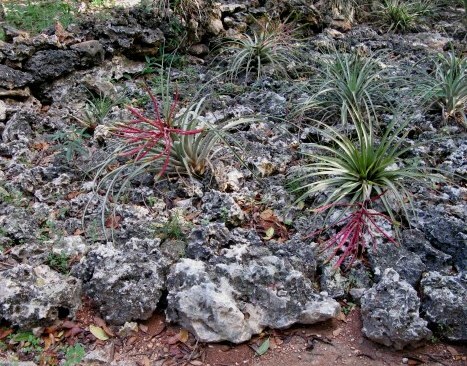 The geological history of the land has left its legacy in karst formations on which 'air plants' live. I was fascinated with this, having small replicas of these plants in my own home. Walking on down the path, I was totally unprepared for what I found. 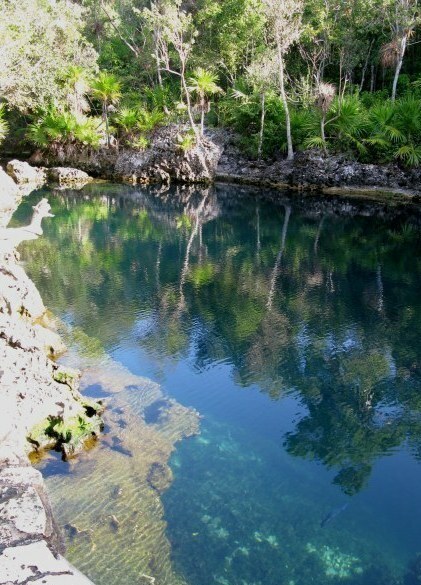 The lagoon is a formation called a cenote and is the result of the collapse of a cave roof. 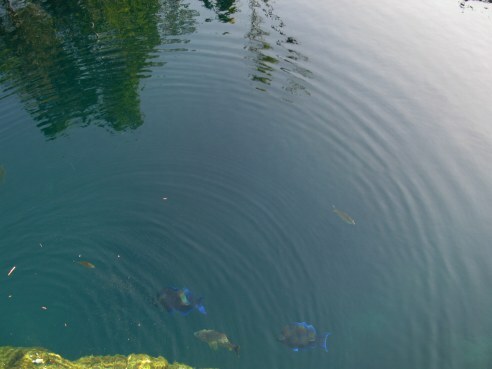 Here you can dive to find the subterranean passage through which the multi-coloured fish enter these waters, or just swim here with the fish surrounding you – best done in summer. There are overhanging rocks under which to swim – and if you dive below about 3 metres (10 feet) the salt layer envelops your body with a warmth that can be lacking above. 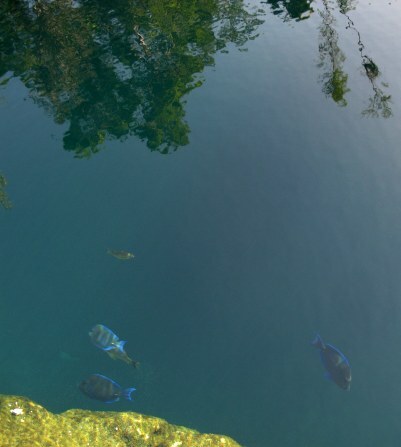 We stood for ages, staring into the water, mesmerised by the tranquillity and the colourful varieties of fish below. As anyone who has been distracted from their impending dental appointment by watching the aquarium fish in the dentist’s waiting room knows, watching fish casts some sort of magical soothing balm into the mind. Minutes passed into perhaps half an hour. The companionable silence was punctuated only by occasional eye contact and a smile – for watching this water ballet cast a special spell over us. I was glad that I was travelling with someone who understood my 'month in Cuba with no plan' plan. Had we had a plan we may have had to be somewhere to do something. As it was, we had none, and the fish took their time to write the memory in our souls. 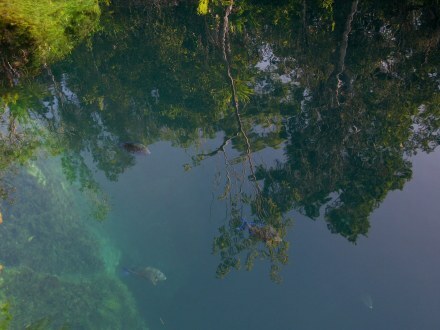 With the reflected tropical vegetation surrounding the underwater cave, it was as if there was no such thing as above and below. It was a sort of Cuban metaphor, for in Cuba I find I find that for me there is no past and no future – just the moment. Perhaps that is what makes it so special, for we of other countries have mostly forgotten how to immerse ourselves totally in a moment. It is becoming a symptom of modern life that no one is anywhere they are any more: they are either plugged in to earphones, checking or sending text messages, or talking on the phone – while the moment, with its scents, its sounds, its curiosities, is not being absorbed during a superficial pretence of 'having been there'. What did the fish teach me? and look toward another land. There is no other land.